At the end of a long trying day, I found I needed to wrap my horse’s hind foot. It’s not easy to wrap a hoof, and harder still when you haven’t done it in 10 years and your old stiff horse can’t hold his leg up for long or keep it steady. I tried to remember the technique and visualized going through the motions, but still I was all thumbs with the roll of elastic bandage. I couldn’t seem to figure out how to wind it around his hoof so it actually covered his hoof, I somehow had the roll twisted with wrinkles all over instead of it laying smooth. After a good 15 minutes of undoing it and redoing it, I thought it was passable. Next came the easy part, the duct tape layer to protect it and keep the bandage in place. The end result sure wasn’t pretty, and I wasn’t confident it would hold. But the horse and I were both tired of this and I didn’t want to make either one of us go through another attempt. I was looking at it wondering if it would be ok till morning. Laughing at my ineptitude, I told my horse I’m sure it’s one of the worst wrap jobs he’s ever had in his life and he probably knows a lot better than I do how to wrap properly! At that point he turned his neck completely around to the side to look at the hind foot I had just wrapped. 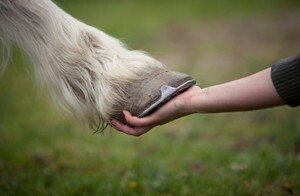 He lifted his leg out to the side like a dog, still with his neck flexed, looked at the hoof then me, then hoof then me. A disgusted look came across his face. He remained in that position, holding his leg up, neck flexed to see. And it’s not easy for him to stand that way! He’s only got 1 good leg to stand on. I had him put his foot down to rest, checked the wrap again, added a little more duct tape and told him I thought it would be ok.
What else could I do but comply? I said I would and he put his foot down and let me remove the wrap with scissors. When I did so I saw the issue and that it would have shifted overnight and become uncomfortable. He was extremely patient and helpful letting me rewrap it properly, holding his foot still, at times resting it on the toe so I could still gain access to the sole while his leg took a little needed rest. The 2nd attempt turned out much better than the first. He was right in making me redo it. This horse often uses obvious physical signs like this to go along with his telepathic messages, when we’re either not listening, don’t take him seriously enough, or simply can’t understand what he’s trying to tell us. Often he points a foot to indicate a problem, or his nose touches the spot on his body that hurts, or he’ll toss his head when we get the ‘right’ answer. He goes out of his way to help the communication be clearer.